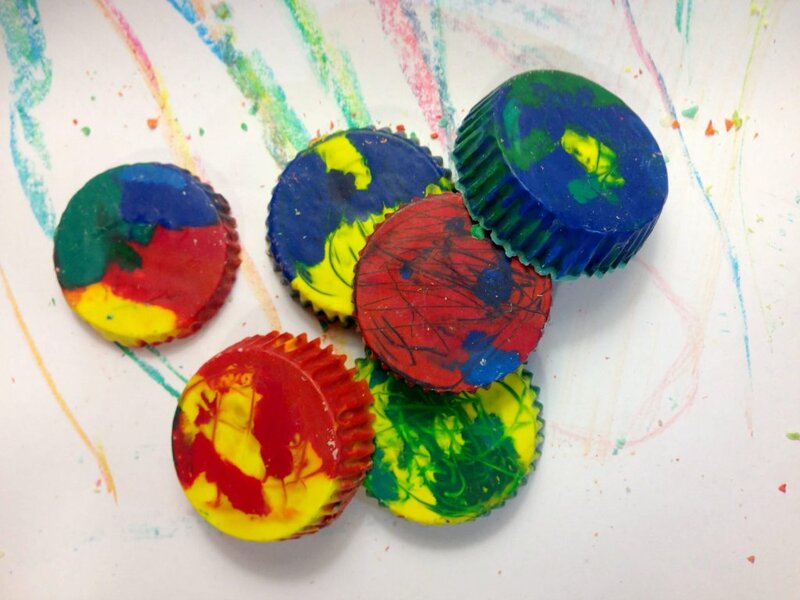 DIY Crayons – We reused broken crayons bits that would otherwise be thrown out to make brand new round, multicolored crayons which are easy to hold for small hands. Our DIY Crayons are the perfect size for the small hands of my daughter Margo (15 months). 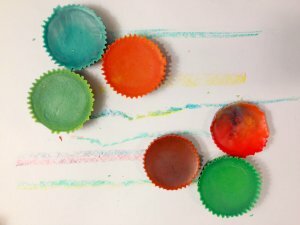 I teamed up with my three nieces Isabella, Francesca and Vanessa again (see No-Churn Cherry Chocolate Chip Ice Cream) to bring you a do-it-yourself guide on how to make homemade crayons! 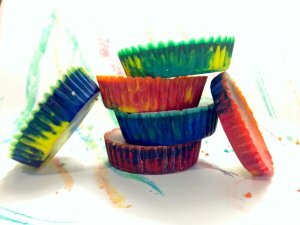 to create a solid color, use a wooden tooth pick to stir the melted crayons after they come out of the oven. Step 1: Preheat your oven to 350 degrees F (176°C). Gather your old broken crayons and remove ALL the paper on the outside of the crayons. Discard the removed paper. 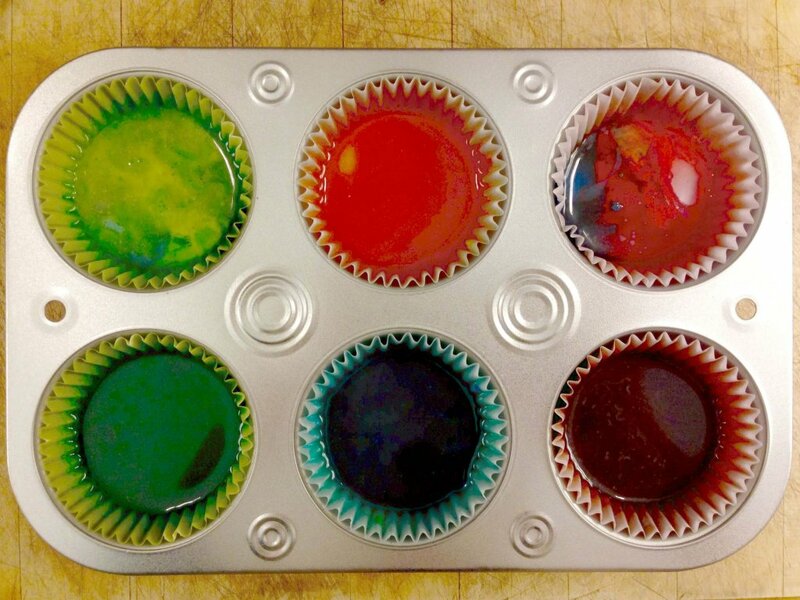 Step 2: Line a muffin tin with cupcake liners. Evenly distribute the amount of crayons between the cupcake liners. You can fill between 1/2 to 3/4 full. Step 3: Place in oven for about 5 minutes. Check the oven window periodically to see if the crayons are completely melted. You may need to leave them in the oven for an additional 1-2 minutes. Step 4: Once the crayons are completely melted. Turn off the oven. 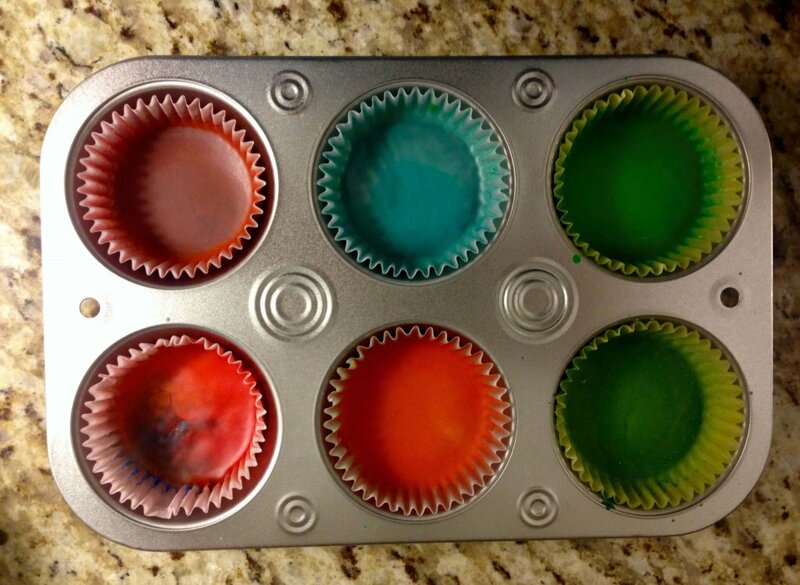 Using your oven mitts, take the melted crayons out of the oven and allow them to cool completely. At this point, you have the option to leave them, as is, or stir them with a wooden tooth pick to get a more uniform color. We stirred them just enough to have the top be a solid color but not thoroughly enough so that the bottom remained multicolored. We sped up the cooling process by allowing them to cool on top of the oven for a few minutes and then putting them in the refrigerator uncovered for about 10+ minutes. 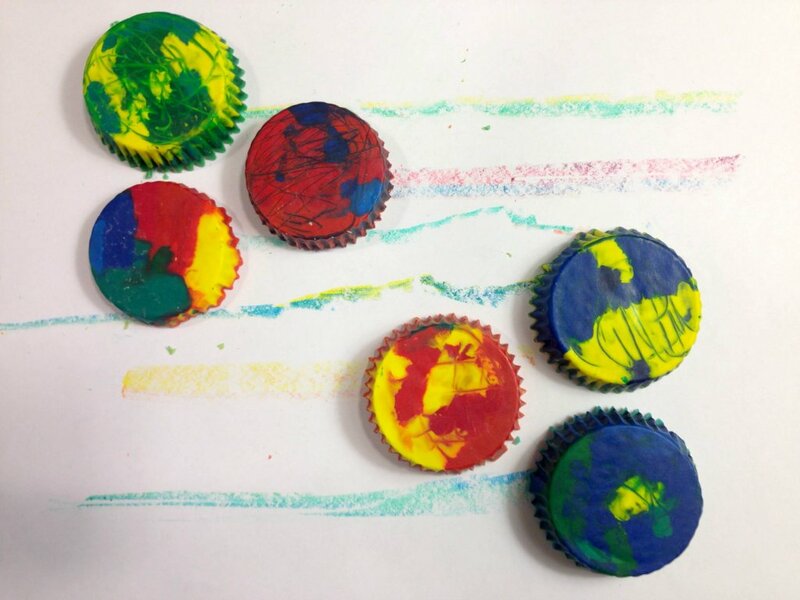 If you make crayons using my “DIY Crayons” tutorial and post a picture on social media, be sure to #lifeslittlesweets and link back to the post, thank you in advance! Here is a link to some FREE, printable coloring pages on the Musical Yoga Adventures website. Linda Lara created and owns Musical Yoga Adventures; she creates wonderful music and yoga routines for kids and she is also my mother-in-law 🙂 She has 3 CDs (Musical Yoga Adventures, Musical Yoga Adventures: World Journey and her latest album Musical Yoga Adventures: Songs for Baby) and her music is also available on iTunes (download iTunes for free here). This is a clever idea for recycling broken crayons. There is always a never ending supply of broken crayons when kids craft! I can see these really useful for the preschool set where the large easy grip and sturdy crayons would be a big help! My grandkids wil love helping make these. They will be collecting broken crayons for this project soon! Hi Diane, aww, that warms my heart to hear this comment:) I really had a nice time doing this simple activity with my daughter and nieces and my daughter has been playing with them all week since we made them! I think it’s also good because it teaches reusing and recycling to young ones – plus the crayons are just really cool! These look good enough to it lol No, but seriously why they don’t make chocolate cups as colorful and cute, I would surely buy some 🙂 maybe thats a recipe idea for me! These crayons are so creative and perfect for little hands! Hi Katalina, I think you are onto something! Yeah, these are a great size for first crayons. Thank you for stopping by! 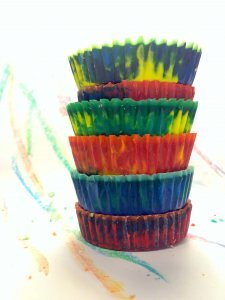 I never thought of making my own melted down crayons!!! Thank you for this post, now we can use homemade crayons and not waste our resources. Once it is melted do you think you could pour it? I have some silicone ice cube trays (from IKEA) that are long and thin. They would make a great shaped crayon. Hello Claire, Thank you for your information and stopping my by blog! I am always in favor of reusing anything that can be reused, it is a teachable lesson to young ones too about being kind to the earth by not wasting and being resourceful:) I would be vary of pouring the hot wax if doing this with children. Perhaps best to avoid that scenario all together. I think it would be good to just put the broken crayons in the molds and there are so many shapes of molds available, yes, the silicone ones would work great! 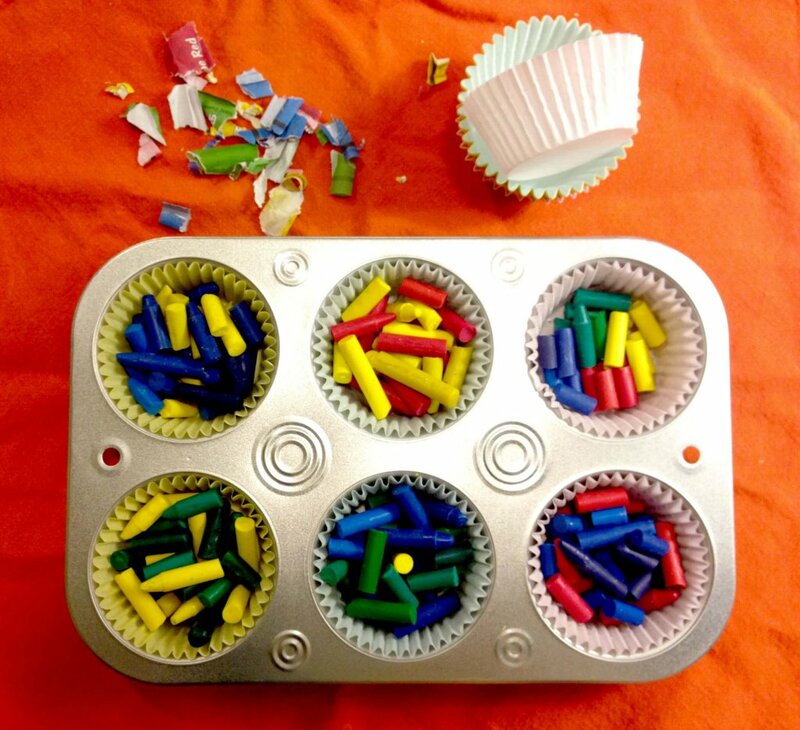 If it’s long and thin (like the IKEA ones you are describing) and wouldn’t fit the broken crayons as easily as say the muffin tin, perhaps chopping up the crayons (having an adult do this part of course!) and putting in the small, chopped pieces might work better to get in that kind of shaped mold. This could produce some interesting, multicolored crayons, if you are mixing the colors or I guess you could sort the broken crayons by color too, to get more of a uniform color. Thank you for your comment and information! Don’t feel like you need to continue the chain if you don’t want to, but at any rate I still wanted to let you know that I think your blog is so much fun and I love all the recipes/crafts! Hi Sarah, Thank you so much, I am so honored! This brings back so many memories for me! My mom has run a daycare for 30+ years and she always had tons of broken crayons she turned into “crayon cakes” as she liked to call them. Such a great way to reuse suppliers and create new tools for little artists. Thanks for sharing! Hi Caitlin, thank you for visiting my website and sharing your memory! I love that. 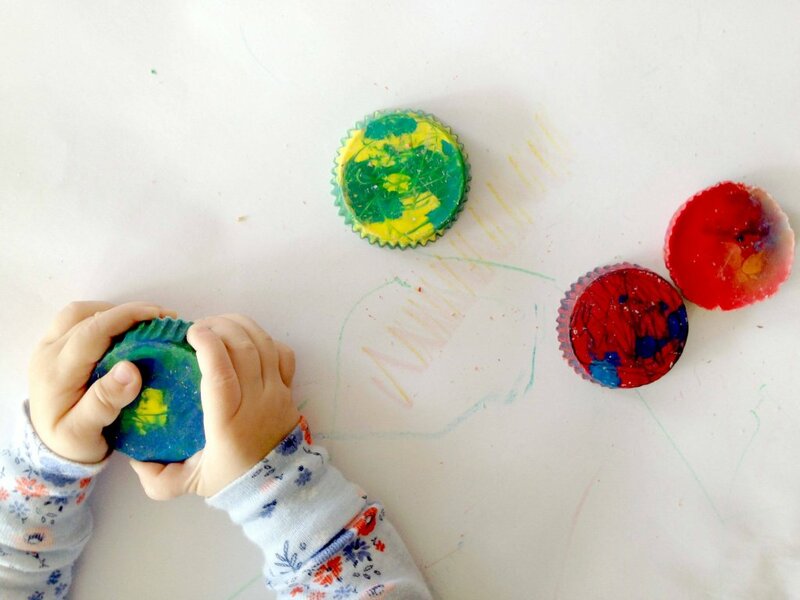 Crayon Cakes is a good name for them 🙂 I want to include more DIY and Kid-Friendly DIY on my blog because this post was so much fun. I will be checking out your site!